Buckwheat and Tomato Stuffed Zucchini | Naturally. As promised, here is the first installment of the ingredient challenge. If you’re wondering what I’m talking about, last Monday I asked readers to submit 2-3 ingredients they have in their kitchen and I would pick one set and whip up a recipe. There were SO many great ideas and I started brainstorming on all of them, but I really liked the idea of using buckwheat with summer produce and so, I went with the combination of buckwheat, tomatoes, and zucchini (thanks, Cristina!) It’s around this time of year that zucchini seem to dominant and frankly, shredding them for zucchini bread will only get you so far. I love stuffed zucchini because it’s a great vessel for many different ingredients. This zucchini buckwheat salad where you could substitute tomatoes for corn (or just add the tomatoes into the salad without leaving anything out, still fantastic). 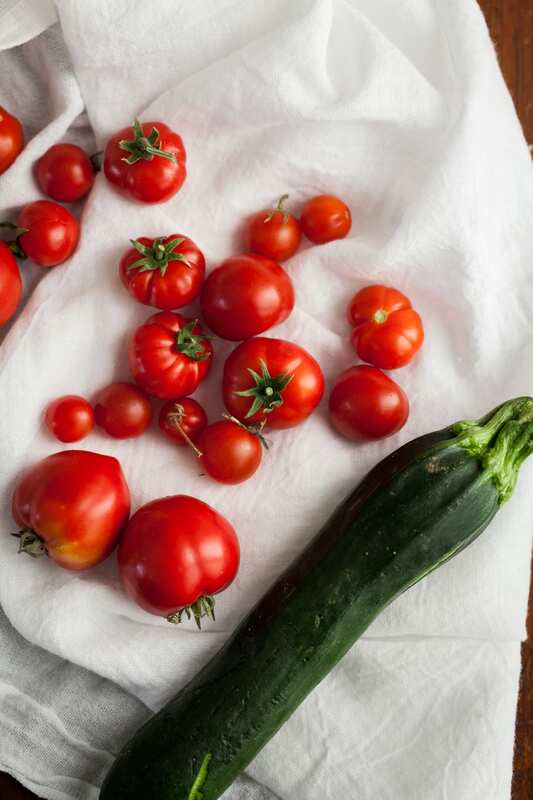 Do you have any ideas for buckwheat, tomato, and zucchini together? I’d love to know! Feel free to leave links in the comments. Preheat oven to 400˚. With a knife, hollow out the zucchini, leaving roughly a 1/4″ lining of zucchini. Place zucchini in a baking dish. In a blender or food processor, pulse garlic into small pieces. Add diced tomatoes, basil, salt, and pepper. Pulse until tomatoes resemble crushed tomatoes. Place in a bowl and add buckwheat, stirring until well combined. Divide buckwheat mixture among the zucchini. 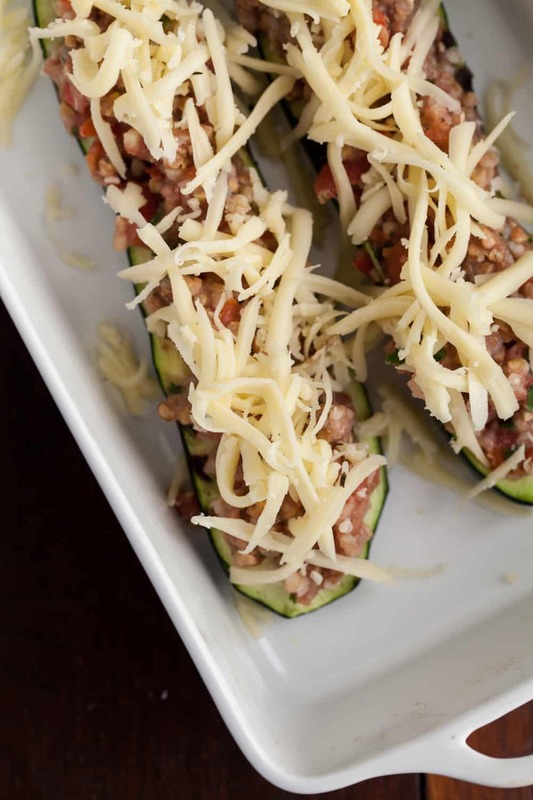 Bake zucchini for 20 minutes, sprinkle tops with cheese, and bake for another 5-10, until cheese is melted. Serve with a sprinkle of fresh basil. *I used Roma tomatoes because they are a bit meatier. If wanting to use regular tomatoes, squeeze out a bit of tomato juice before adding to the blender. *Need instructions for cooking buckwheat or kasha, see here. *If wanting this to be vegan, leave off cheese or sub your favorite vegan cheese. *I used smallish, medium zucchini- so adjust filling as needed. What a fun idea – feels like an episode of Chopped! I’d love to make this with the zucchini coming out of my garden. I’ve never actually cooked buckwheat – so that’s my next challenge. Thanks for the inspiration, Erin! Perfect timing, as I just pulled about 8,000 zucchini from the garden. 🙂 Looks amazing! I love buckwheat crepes so will definitely check the recipe out Erin! These look delicious and hearty too! 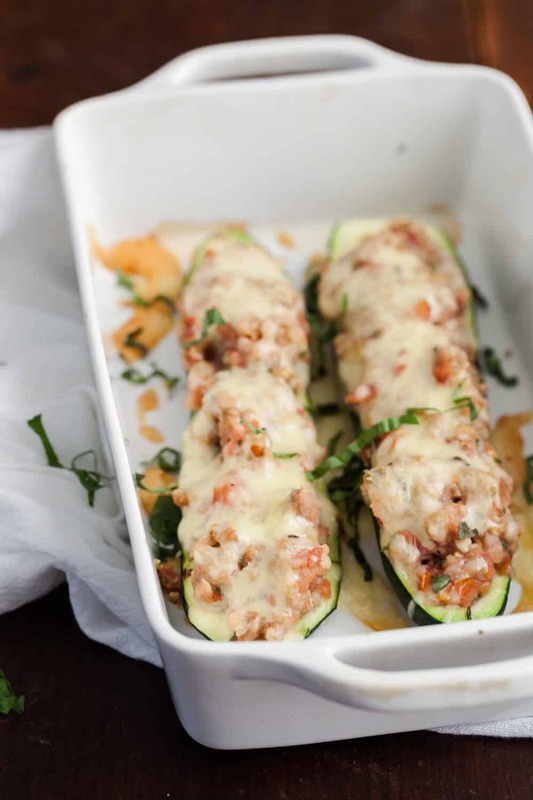 I love cooking Sausage stuffed Zucchini Boats and I am sure it is everybody’s favorite 🙂 You just have to replace tomatoes with lean Italian chicken sausages for that. But I think the one you suggested have unique appeal and is less time consuming. Thank you so much for sharing this wonderful recipe. I simply loved it! Yum! Stuffed vegetables really are a summery dish for me, and I’m always trying to find vegetarian and vegan versions of it. To be totaly honest, none of which I have tried worked well for me, I always found the stuffings too wet and mushy, or too vegan-tasting, not in the good way you know… I’ll try yours to see if it makes the trick for me! When I saw your list of ingredients, I first thought about crepes with buckwheat flour, just as you say in this post, and then I thought about buckwheat and zucchinis patties with tomato salsa (or maybe roasted tomatoes? Even roasted tomatoes salsa? Or a rich tomato sauce/homemade ketchup?) I did not cook them but it was good brainstorming around this! I’m going to try to raw-ify and vegan-ize this recipe… First sprout the buckwheat groats rather than cook. That can be done pretty quickly – soak for a ½ hour then drain – ready in not much more than 36 hours. Actually I eat groats as part of my breakfast after soaking in warm water only 20 minutes or so… In a pinch that would work too, but sprouts have more nutrition… Make wide zucchini noodles with the thinnest setting of the mandolin. Squeeze juice of ½-1 lemons over the zucchini. Top with combined tomatoes, garlic (adding basil or whatever fresh herbs you have) and top with an onion cashew sauce instead of cheese… Can’t wait to try it! 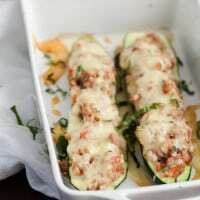 I love stuffed zucchini – and paired with tomatoes makes it the perfect summer dish. Will be making this one right away! Yum! 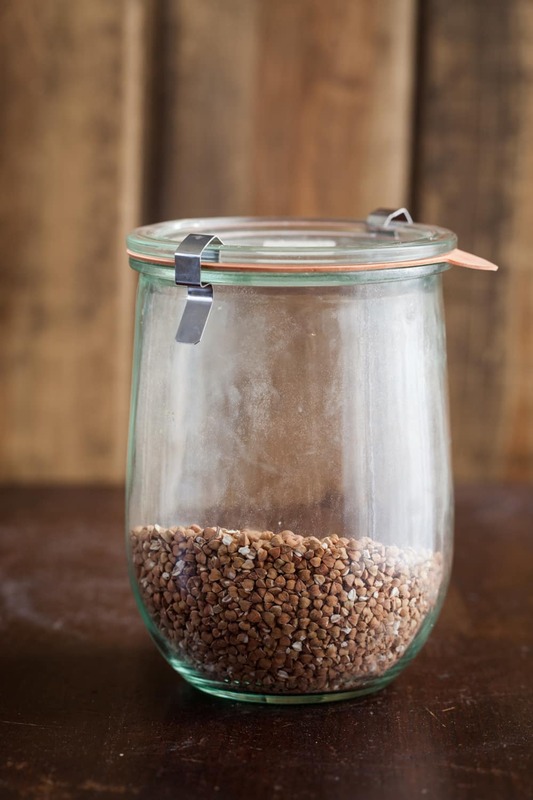 I’ve never cooked with buckwheat, there are so many great grains, I’ll have to try it out. Also, I adore your bubbly weck jar. So cute! You have a beautiful blog! I could spend hours looking around here. I love earthy and cozy feel of all of your recipes and photos. I love buckwheat and I love zucchini. Putting this on my list of things to try! I love how you can use this stuffing as a base for just about any stuffed veggie recipe! Stuffed peppers, stuffed eggplant…the sky is the limit.